General Electric shares rallied Friday after the company announced new CEO Larry Culp’s compensation package. If Culp is able to boost GE’s stock price by 50% to 150% within four years, he would make up to $US300 million, according to CNBC. Watch GE trade here in real time. General Electric shares rallied Friday after the company announced the contract details for new CEO Larry Culp. If Culp, who was named chairman and CEO on Monday, is able to boost GE’s stock price by 50% to 150% within four years, he would make up to $US300 million, according to CNBC. The calculation will be made using the highest average closing price over 30 consecutive trading days during the four-year period from October 1, 2018, to September 30, 2022, the company said. The contract says that if the GE’s rises by more than 50% in the next four years, Culp would receive 2.5 million shares at that price. If the stock climbs 75%, he would receive 7.5 million shares. However, Culp will not receive any payout if price appreciation falls below 50%, the statement said. Culp will also receive a salary of $US2.5 million a year and an annual bonus of up to $US3.75 million, the company said. Beginning next year, Culp will also get an annual equity award valued at $US15 million. GE shares were up 4% following the announcement. Culp comes to GE at a critical time. He replaced John Flannery earlier this week, who served at top of the company for just over a year and was ousted amid his attempt to turn around the company. 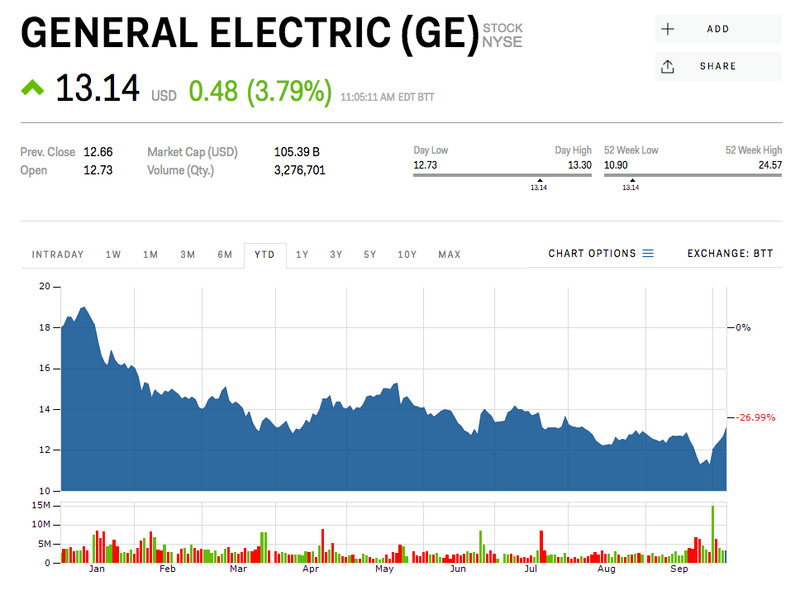 GE was down 27% this year.